Image caption Hassan Rouhani: "We should not be concerned about the expression of diverse views"
Iranian President Hassan Rouhani has called for greater academic freedom in Iran's universities. Speaking to students at Tehran university on Tuesday, the reformist leader said restrictions limited innovation. "Irrelevant restrictions will lead to lack of tolerance [and] the departure of honest, competent individuals," he added. Mr Rouhani has met with opposition from those in Iran who oppose reform. During his speech, which was broadcast on state television, Mr Rouhani urged against creating "a climate of flattery in the university". He added: "We should not be concerned about the expression of diverse views by university professors." The president also dismissed concerns that foreign professors might be spies, calling such statements "excuses". Addressing students at the start of the academic year, the president expressed his disappointment that no students had spoken at the ceremony. "I am here to listen, not to make a speech," he said. "It is a matter of regret that there was no speech by a student association representative in today's programme." Mr Rouhani also added that an Islamic approach to science did not mean that that the subject should be dismissed. 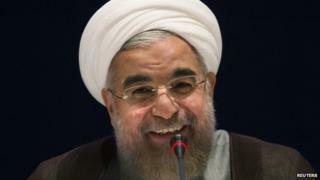 Correspondents say Tuesday's address was an indication of Mr Rouhani's desire to uphold his election promise of greater openness in Iran - but hardliners in the country's ruling elite might be less than pleased. In August, Reza Faraji Dana, Iran's Science Minister who also managed the country's universities, was impeached and sacked by the Iranian parliament. Those who voted for his dismissal were angry that he allowed students expelled from university after the anti-government unrest in 2009 to return to campus. He was also accused of nominating people involved in the protests for senior department positions. In September 2012, backed by the government, more than 30 universities blocked women from enrolling on close to 80 courses. Though Mr Rouhani opposes such restrictions, it is Iran's supreme leader, the deeply conservative Ayatollah Ali Khamenei, who has the final say on all significant issues.